Subscribe to the Celtic Music Magazine. This is our free newsletter and your guide to the latest Celtic music and podcast news. Remember to support the artists who support this podcast: buy their CDs, download their music on iTunes, see their shows, and drop them an email to let them know you heard them on the Irish and Celtic Music Podcast. Subscribe to the podcast on iTunes today! We have a big feature on iTunes this week. So if you're new, I want to welcome to the incredible world of Celtic music. We celebrate St Patrick's Day all year long. Every week, you get an action-packed, hour-long show full of Celtic music. Many of these bands are small, independent artists whoh don't have the financial support of a giant record label. They can't afford a publicist. So I bring you their music for free... with the hope that you might find a new favorite band and buy their music. If you enjoy what you hear. Please support the artists. You can also support this pdocast by sharing it with your friends. As always, I want to send out a HUGE thanks to the patrons of the podcast. Your generous pledge of as little as $1 per episode pays for the production of this podcast as well as my time in producing the show. You will enjoy a personal podcast feed where you can listen to the show before regular subscribers, occasional extended editions of the show, and my deepest thanks. When we hit a milestone, you get a 2-hour special. Thanks to our newest patrons: John OConnor, Keriann Noble, Mary Botkin, Samuel G, Donald McLeod, and a extra special thanks to our newest Celtic Superstar, Nancie. Thank you all for your generosity! Become a patron today! 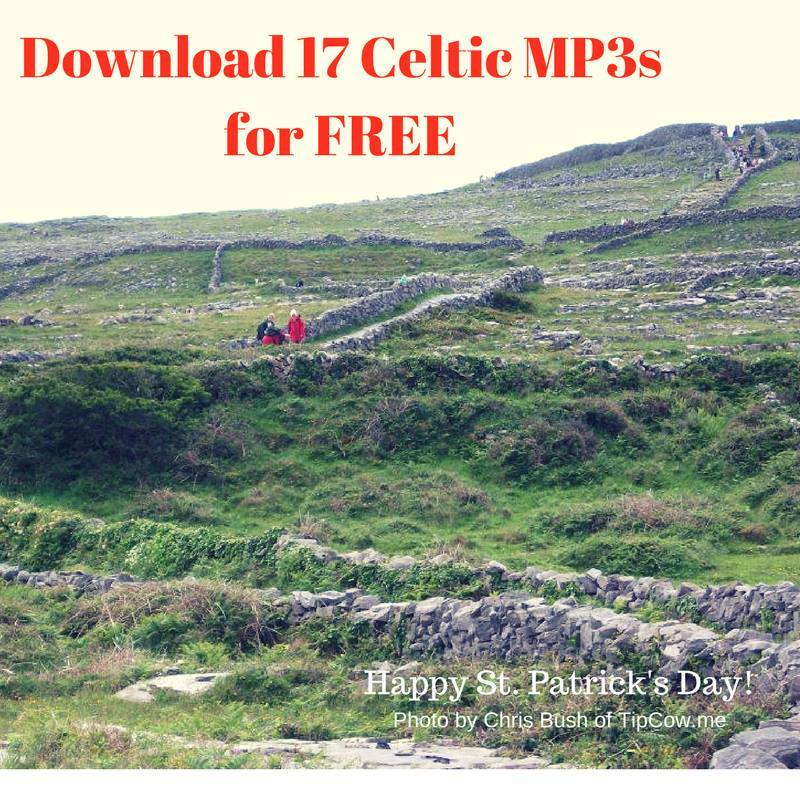 If you haven't downloaded your Free Irish & Celtic Music Podcast app, go to iTunes or Amazon and do so today. Listen to past St Patrick's Day episodes on our website. You can also find other St. Patrick's Day shows to check out, including St Patrick's Day Podcast and Pub Songs Podcast. I posted a 2-hour St Pats Special there last week. Finally, I hope you listened to show #298: 17 for St Patrick's Day. Because you can download all 17 of those songs and tunes right now. Click here to read the article and download the MP3s. Dan Cunningham emailed me on Facebook: "Thank you Marc for your podcast and all you do for the Celtic community. I've been an advid fan for years We receive your podcast on TuneIn and it's tradition that my wife and I listen to the new podcast every Saturday morning during our breakfast. My wife Cindy and I live in the North land of Minnesota and we both look forward to the weekends and the Irish and Celtic music podcast. God bless." Google changed their voicemail service. I can longer download the audio files. Fortunately, their voice-to-text feature is pretty good. I got a voicemail from Heidi Jane: "Hey Mark, I just wanted to say thank you very much for including me. It's really an honor, and I'm just grateful. It's a good time of year to remind me to tell people about your podcast. Thank you so much and happy Saint Patrick's day. I'm really glad that you are doing this for everybody and for the music. It's very noble and wonderful. Take care." Jason Roberts sent: "Hey mark, I've been a listener since pretty much the beginning and I just want to send a huge amount of congratulations out to you for your 300 episodes. I record audio and produce learning video for my job in the computer world, so I truly understand the huge effort that goes into planning and recording your audio and producing these podcast sessions. I also dabble with playing guitar and my favorite music to play is Irish trad music. You're an inspiration along with all the artist that you help, and I wish you the best on your next 300 episodes. Hey, man when you finish this next podcast. Take a few minutes and enjoy a pint or three of the black stuff." 1:07:38 "She Moved Through the Fair" by Abby Green from Why Should I?